Michael, my stand-up paddle board instructor from Lomma Beach House, grips the front of my board, chest-deep in water. “Really? I’m fine not …” I assure him. Crouching on the board, I can already feel my thighs shiver. 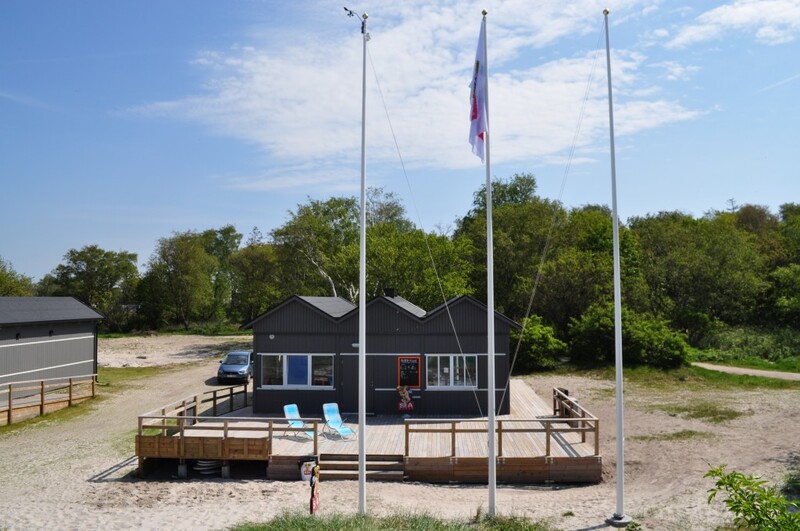 A rare moment at Lomma Beach House where there are no lines for the little snack shop. I’ve already tried this. Twenty minutes earlier. I was successful. For about 30 seconds. As soon as I gripped the paddle and attempted to actually do the task at hand — stand-up paddle boarding — I fell, face first into the oh-so fresh Baltic Sea. I slowly rise, taking every ounce of strength in my legs to propel me up. “OK, now, stay there, I have to go get my board,” he says, swishing through the sea behind me after his board, which has floated some distance away. Then, my legs quiver more. The board dips to the left. Dips to the right. And, I plunge back into the water. I brush off the water from my eyes and stand in the soft sand, water at my waist, smiling. A far cry from the attitude I had earlier in the morning. “I really, really don’t want to go paddle boarding,” I had confided in Anna, my guide for the last portion of my Sweden trip (through the Malmo region), when she picked me up from the train station. In fact, when I had looked at the weather the other week from the safe confines of Las Vegas, I was delighted to see cool temperatures, rain and general gloom. Forgetting about the fact wet suits exist, I figured I wouldn’t even have to argue about the activity. It just wasn’t going to happen. “It’s OK, you will like it,” she assured me as we drove past blooming fields of canola, glowing bright yellow on jade green stems. I looked out the window, heart racing about the “light adventure” I was about to embark on. I don’t do adventures. At all. I try. But every time I try to do something adventurous that involves my feet not being firmly planted on the ground, I end up in precarious situations (see Parafalling in Turkey for a prime example of what not to do when going paragliding). When we parked at Lomma Beach House and walked up the sand to the wooden beach house, I saw two large paddle boards propped against the deck. My first instinct was to run back to the car and skip straight to our organic lunch. Immediately. I have no desire in the world to do this. None at all. Nada. “Come on,” she urged me. Erik Bilder, the owner, and Michael, my instructor for the day, stood outside, waiting for us. “I figured we would go out there and learn, then we will paddle board through the Lomma harbor, through what I like to call the bayou, and then over to the church,” Michael explained. Ha. I can’t even imagine myself making it to an upright position on the board, let alone paddling around town. Somehow, I managed to convince Anna and her friend to take the lesson with me (strength in numbers, right? ), and the three of us headed into the changing room to put on wet suits. “Is this like Spanx, where we have to struggle to put ourselves into the suit?” I asked to no one in particular. Carefully, I put one leg and then the other into the suit, pulling it up, over my body and have Anna zip it up. When we walk out, it’s obvious we’ve done something wrong when Michael takes one look at us and stifles a laugh. “You’ve put them on inside out,” he says. “So we have to go back in and put them on again? We can’t just go like this?” I asked, dreading having to pull the suit off only to flip it right side and pull it back on my body … again. Finally, we emerged, suits on correctly, and head to the beach with our boards in tow. 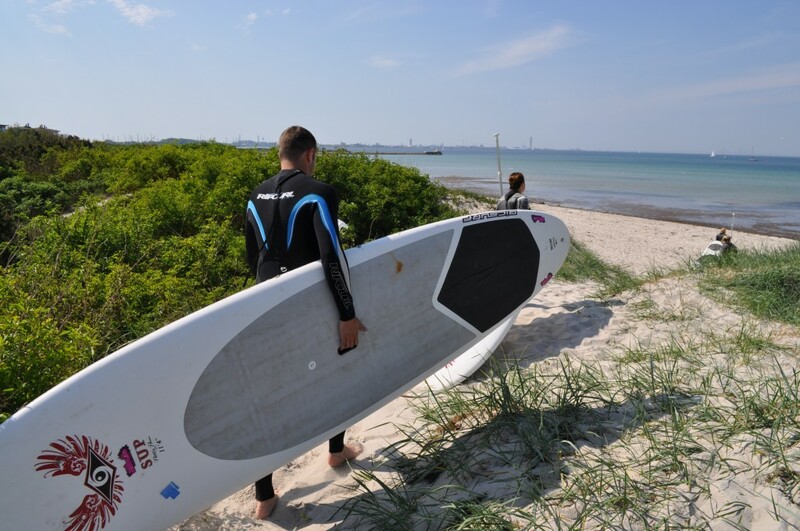 Board in hand, ready to hit the chilly waters of the Baltic Sea. The four of us, feet sinking into the sand, at the brim of the Baltic, attempt to loosen our legs. Then, he begins to guide us through the basics of stand-up paddle boarding. After showing us how to stand up, he goes through paddling. It’s an upper torso stroke, not an arm stroke. I think back to the time I went kayaking in the Mediterranean. The circles I did in the water. Not being able to make it to the island without being towed. 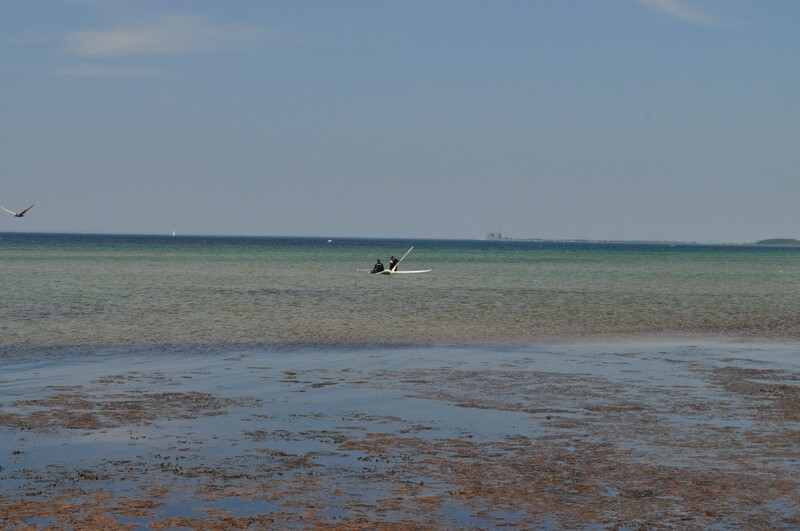 He lifts his board and steps into the water, through feet of seaweed. We follow suit, pulling the large boards behind us and stepping into the gooey mass of tangly weeds. Immediately, the icy cold water sends shocks through my feet. Thank goodness for wet suits. We trudge through the seaweed and into the water. “So, now we get on the boards,” he says, putting his upper body on the board and then pulling his legs on. The other women I am with have no problem. I try to do the same, flinging my body up. It’s not easy, but it isn’t as hard as I imagine either. “Now, we need to get further out into the water,” he says, dipping his hands into the water and paddling with them, oar under his body. I do the same, plunging my hands into the water. Like with my feet, the cold water sends shocks through me. But, after a few minutes, under the sun that finally decided to come out, it is refreshing. Once we’ve gotten far enough out, it’s time to try to stand. The beginnings of the stand-up portion. Slowly, board dipping from side-to-side, I manage to pull myself onto my knees. I’m kind of doing it. I stay like this for awhile. Attempting to paddle, but the current and I aren’t friends. While the others stick together, I end up floating away from them. Michael sees I’m straying and gets off his board and comes to get me. “You’re pulling me in, eh?” I ask, being taken back to the kayak in Spain. “You are just getting a little away from us,” he assures. I prolong the stand-up part of the stand-up paddle boarding experience for a bit longer, trying to convince myself I can do it. When the others stand and begin to paddle, I realize I have to do the same. So, wobbly, and pulse thumping in my ears, I slowly try to stand. “Now, stand up,” he guides. Holy crap. I am standing. On a paddle board. In the sea. My thighs shake. I can’t move. Not yet. I try to focus on a spot in the sea, like I do in yoga when trying to balance. But, this is a moving sea. And the focus shifts. And I am distracted by the fear of falling. I dip the paddle in the water. I feel the board dip to the left. To the right. I try again. This time, the board wobbles too much and I can’t keep my balance. Then, I am face-first in the water. In the Baltic Sea. Rather than being upset I’ve fallen, upset I couldn’t stay on the board, I am invigorated as the water hovers at my neck. I’ve just fallen into the Baltic Sea. Fallen off of a paddle board I never imagined I’d ever be on. This rocks. We continue in the water for another hour. Well, Michael and I do. The others have gone in. After my last attempt, which resulted in another plunge, I decide my “light” adventure is done for the day. I don’t want to admit it to Michael, so I at least keep the oar in my hands as I ply him with questions about his background. 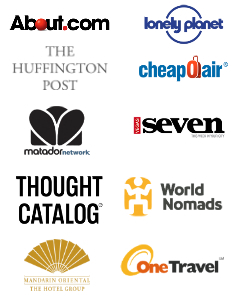 Turns out, like me, he is an avid traveler. He’s working the beach house this summer after a stint in Normandy working at a brewery. The two of us straddle our boards, letting the water gently bob us and send us back to shore. I liked sitting on the board more than standing! When Eric comes to the beach and waves his arms at us, letting us know it’s time to come in, I actually don’t want to. He waves his arms some more. We head back to solid ground and I peel off my suit. It’s time to go to lunch, a quick bike ride away. This time, she lets me off the hook as we head to Lomma’s new harbor. “Light” adventure: accomplished. At least a little bit. Editor’s Note: All photos are courtesy of Lomma Beach House. My time in Sweden is courtesy of Visit Sweden, however all opinions are my own. If you have questions regarding this, please read my disclosure policy. Want more on Sweden? Follow along in Twitter and Instagram, #myswedentrip. I’ve always wanted to try paddle boarding, but it sounds a lot harder than it looks. Kudos to you for trying something out of your comfort zone and in the Baltic Sea, which must have been cold, with with a wetsuit! Michael and the others made it look easy!! It was cold! But, after awhile, with that lovely Swedish sun shining down, it was perfect. I love that you didn’t give up, you go girl! I figure I have to at least try something new before I can decide if I like it or not! SUP isn’t easy, but it’s fun once you get the hang of it. I learned how to do it last year and enjoyed it. Good job for giving it a go! Thanks!! I am so awed by your recent race that included SUP! It’s awesome that you gave it a good try. I’m not sure I’d want to do this either. Paddle boarding, surfing, all that stuff, just doesn’t sound appealing to me. Funny you mentioned that you haven’t ridden a bike in so long, I’m trying to get comfortable riding my new bike in Germany after almost 20 years without riding a bike. Ha! It was fun! Didn’t have the desired results I would have liked (aka being able to stand up and do it for any period of time), but I will take it! First of all…GREAT essay. I loved the narrative…you definitely caught and held my attention from the lede…brava! Second, I’ve been SUP and I know the feeling—I too first felt as though I just couldn’t do it. It was in Michigan and the water was COLD, but I’m glad to stay I fell in just once (I’d like to think I was pushed…and I kinda was :)). But oh, the Baltic Sea, a completely different experience. So glad you persevered and brought us a medal-worthy blog post! Well, than you very much!! 🙂 I think that just made my day!! I would love to try it again one day! I bet you and Dalene would do so good at it!! 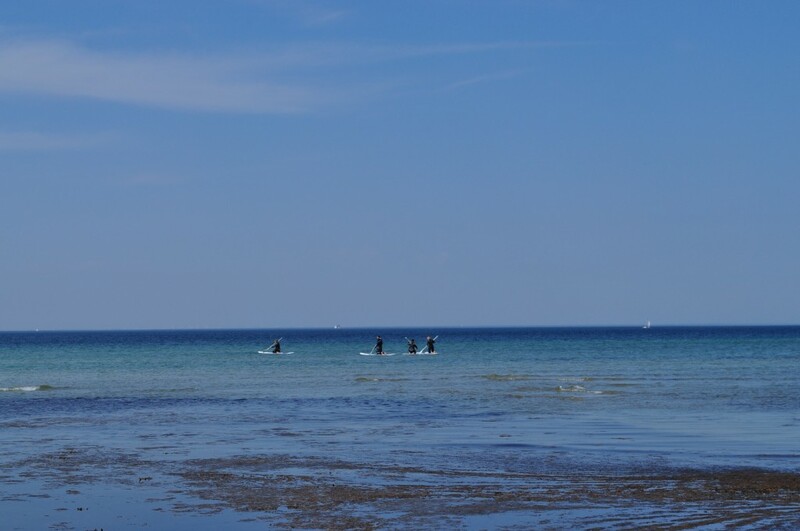 Now I had never considered the Baltic sea a place where to try SUP…glad you enjoyed it! The Baltic Sea certainly was a beautiful place to try it for the first time. The gorgeous water. The view of Denmark. Ahhhh. Good for you for trying it! We took paddleboarding lessons in Key West and loved it – and neither of us fell in once! Granted, the water was pretty calm, but we were happy about that (especially since the water was freezing). Thank you!! I had a very good teacher, which made it a lot more fun! Good on you for not falling!! I am pretty sure “falling” and “Diana” are two words that go very well together. Paddle boarding is definitely not something I would expect to see in Sweden. I’m glad you got a chance to try it! I loved doing it on Catalina Island when there were no waves. I was surprised when I saw it on my itinerary. I had no desire to do it … at all. But, I DID! Even if I sucked, I was proud of myself for at least trying! NO thank you. SUP has never in the slightest even given me the smallest spark of interest. Good for you lady. It was actually fun! I think that’s because, at the end, i just got to sit and float in the water and talk with Michael. I’ve done this in Barbados and Hawaii before, but I can’t imagine doing so in the Baltic. Sounds soooo cold. My lips are turning blue just thinking about it! The water was RIPE! But awesome! You are my hero for doing this!!!! i am so not athletic!! I really want to try this soon. I have a feeling you would be very good at it! !